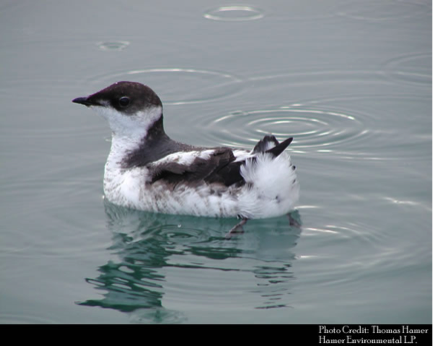 The Marbled Murrelet is an endangered seabird that forages in coastal waters from Alaska to California. 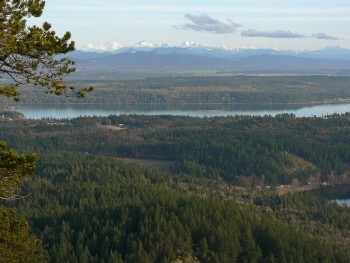 This species was selected for monitoring by the Northwest Forest Plan because of its dependence on old-growth forests for nesting. The foraging and nesting success of murrelets is highly sensitive to climate influences on the marine and terrestrial environment. Researchers from state and federal agencies in Washington, Oregon, and California are modeling the influence of climate variability in the Pacific Ocean on the marine food web in coastal waters and then seeking to understand how these changes in foraging conditions are driving trends in at-sea abundance and distribution of murrelets. Nesting habitat models are also being used to identify the major climate and landscape factors that influence Marbled Murrelet nesting habitat suitability, and to monitor shifts in the abundance and distribution of habitat over time. These models will enable development of focused management and conservation strategies that best support a viable murrelet population under future landscape and climate change scenarios.